The “great bath” is the earliest public water tank in the ancient world. 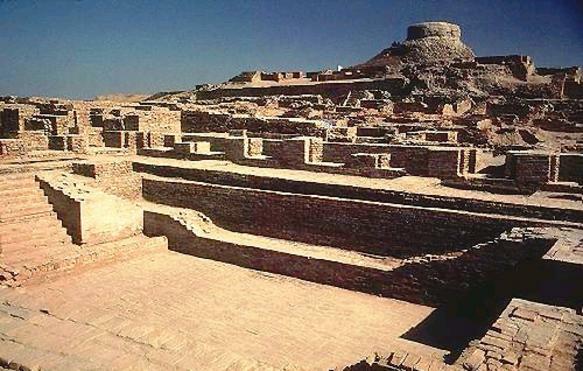 It existed over 5000 years ago in the Pakistani city settlement of Mohenjo-daro. 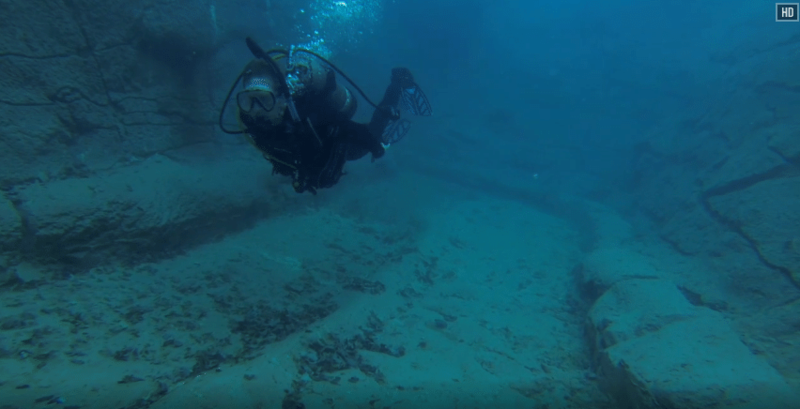 The tank itself measures approximately 12 meters north-south and 7 meters wide, with a maximum depth of 2.4 meters. Two wide staircases lead down into the tank from the north and south and small sockets at the edges of the stairs are thought to have held wooden planks or treads. At the foot of the stairs is a small ledge with a brick edging that extends the entire width of the pool. People coming down the stairs could move along this ledge without actually stepping into the pool itself. The floor of the tank is water tight due to finely fitted bricks laid on edge with gypsum plaster and the side walls were constructed in a similar manner. To make the tank even more water tight, a thick layer of natural tar was laid along the sides of the tank and presumably also beneath the floor. Brick colonnades were discovered on the eastern, northern and southern edges. The preserved columns have stepped edges that may have held wooden screens or window frames. Two large doors lead into the complex from the south and other access was from the north and east. A series of rooms are located along the eastern edge of the building and in one room is a well that may have supplied some of the water needed to fill the tank. Rainwater also may have been collected for this purpose, but no inlet drains have been found. Most scholars agree that this tank would have been used for special religious functions where water was used to purify and renew the well being of the bathers. Probably the most prominent pool history comes from the ancient Greeks and Romans. A major change in the quality of life occurred in these times as individual wealth increased and, with this increase in the standard of living, came luxuries like pools. Water itself played such an important part of society for thousands of years and during this period pools were placed everywhere and for many reasons. Not only were pools considered aesthetic and enhanced the beauty of the property (much the same as today’s custom pools do in our homes) but pools were used for bathing, health, religious ceremony, socializing and much more. In the 6th to 8th Century BC, the ancient Greeks had “Palaestras” which were essentially an open court area between columns and rooms where one could come and wrestle, box, play ball type games and other miscellaneous exercises. But most importantly, there were pools here for swimming, bathing and socializing in. 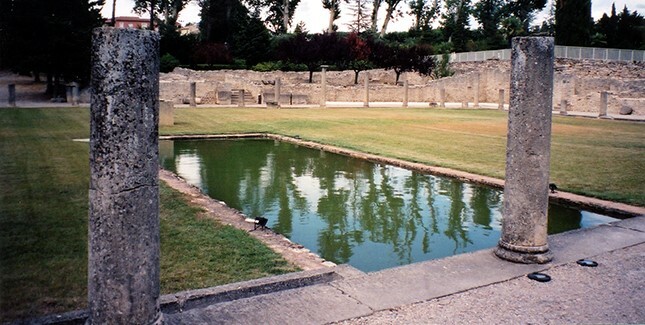 Pools at this time were also used by the Greek and Roman militaries to physically train for war. The great Greek philosopher Plato felt that every child needed to learn to swim as part of a proper education along with mathematics, writing, astronomy, etc. And, in fact, it was standard education to teach children to swim in pools dating all the way back to 400 BC. In AD 305 the Romans built an incredible pool that was over 900,000 square feet. This pool was used for bathing and was also heated by giant fires in the basement beneath the floors of the pool; the columns and walls pumped the heat up to the pool above. You can just imagine how beautiful this must have been with marble and statues in the Roman architecture. Pools were obviously important in society during these ages and used here for many public and social activities but during this time pools were just as important in homes as well. Both Roman and Greek emperors had huge ornate pools with live fish in them. In fact, the word “pool” comes from, “piscine” meaning fish. The first Jacuzzi style custom pool was designed and ordered by Gaius Maecenas, one of Augustus Cesar’s political advisors sometime around 8 BC. This pool was supposedly magnificent with waterfalls, lush gardens, overlooking terraces, libraries, villas and other incredible luxurious décor. Competitive swimming was first introduced in the early 1800′s in Britain by the National Swimming Society. At that time, there were man-made indoor pools in London and the National Swimming Society of England used them for swimming competitions. These events became popular in England and led to the formation of the Amateur Swimming Association in 1880. The swimming strokes used in this time period were the side stroke and the breast stroke. In 1873 John Trudgen introduced the front crawl to Britain used with a scissor or flutter kick. This enhanced speeds and made swimming competitions new and exciting. Improvements to the front crawl, either by different kicks or different ratios of kicks to strokes, resulted in the fastest swimming style known today, now called the freestyle stroke. In 1896, swimming was first included in the Olympic Games in Athens, Greece. One of the first in-ground swimming pools in the United States is the oldest pool in Texas—Deep Eddy Pool in Austin. Deep Eddy has a bathhouse built during the Depression-era, by the Works Progress Administration. The pool began as a swimming hole in the Colorado River, became a resort in the 1920s, and is today a popular swimming pool operated by the City of Austin. Deep Eddy began simply as a swimming hole in the Colorado River that flows through Austin. Cold springs rose from the river banks and people swam in the river where a large boulder formed an eddy. In 1915, A.J. Eilers, Sr. bought the land surrounding the swimming hole and built the concrete pool. The pool served as the centerpiece of a resort, the Deep Eddy Bathing Beach, which featured cabins, camping, and concessions. Deep Eddy Pool is listed as a historic landmark on the National Register of Historic Places and has been the inspiration of various works of art. The first recorded above ground swimming pool in the United States (and one of the first in the world) dates back to 1907, and is credited to the Philadelphia Racquet Club. It was designed by the noted bridge builders, Roebling Construction Company. The Clubhouse was placed on the National Register of Historic Places in 1979. The first swimming pool to literally cross the Atlantic Ocean was installed on the Adriatic cruise ship from White Star Lines in 1907. There was also a swimming pool on the Adriatic’s sister ship, the Titanic. Swimming pools became mainstreamed in America after World War II, and with the advent of Hollywood movies, became a status symbol. Swimming pools evolved as a viable consumer purchase as more and more people began to realize that part of the American dream was being able to take a backyard vacation in their very own swimming pool. 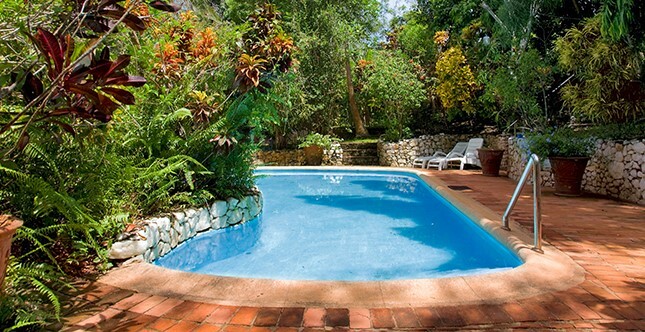 Swimming pools can be found in almost every country throughout the world, even some of the smallest. New Zealand boasts almost 200,000 total swimming pools for its approximately 4 million people, making it the leader in pools per capita. Swimming pools have a long history in the cultures of Greece, Rome, Assyria and Egypt dating back to 2500 B.C. Their modern era popularity took off in the 1800s with swimming clubs, and continued to grow with the start of the modern Olympics in 1896, which included swimming competitions. 2500 BC: Egyptian hieroglyphics depicting swimming. 36 BC: Japanese historic records describe swimming competitions. 78 AD: Romans introduced swimming as a social event to Britain. 1400s: The Catholic Church objects to naked bathing on moral grounds. 1800s: Acrobatic diving is developed in Germany and Sweden. 1830s: Swimming clubs are established in England. 1862: The First documented indoor swimming pool is built in England. 1885: The first diving competition is held in Germany. Briton Matthew Webb is the first documented person to swim the English Channel. 1900: The Paris Olympics feature an obstacle swimming event in the Seine River. 1907: The White star line installs a swimming pool on its ocean liner, The Adriatic. 1908: The international governing body of swimming, FINA (Federation Internationale de Nataion de Amateur), is founded. 1912: Women’s swimming events are added to Olympic Games in Stockholm. 1924: Johnny Weissmuller sets 67 world swimming records before becoming a Hollywood movie star. 1943: Two-piece swimsuits are introduced after wartime shortages prompt a 10% reduction in the amount of fabric used to create swimsuits. 1972: Mark Spitz wins seven gold medals in the Summer Olympics. 2008: American Michael Phelps becomes the world’s most decorated Olympic swimming with a career total of 14 gold medals. Today: The National Swimming Pool Foundation estimates there are more than 10 million swimming pools across the USA, including more than 360,000 public pools that are open year round.